Ornament sharing is one of the best traditions we have started in our family. I love ornaments. 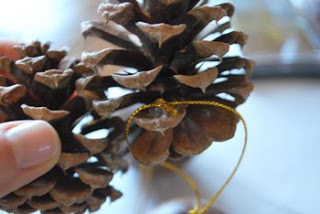 Years ago, we were invited to a friend’s home for Christmas. Their children were well grown with families of their own. Upon seeing her tree, I was fascinated! I didn’t know any of their children, but you could almost know them just by looking at that tree. 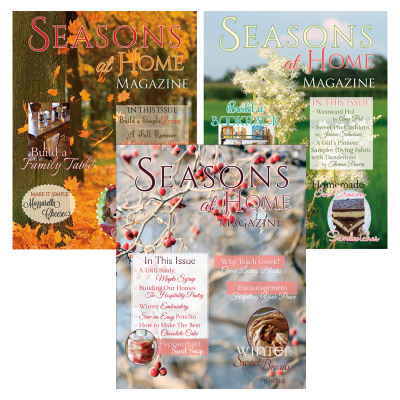 I looked at each one and could see so many loving memories she had to gaze upon. Little hands, quotes, pictures, sewn objects by a beginner -there were so many things, the tree couldn’t fit another ornament. I decided then, our children would make ornaments every year for our tree, and for each other, when they could. 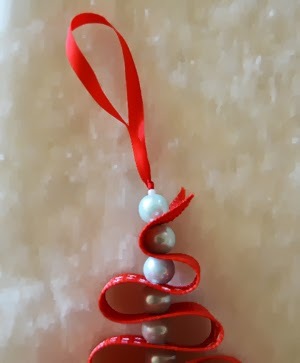 Not only can you make memories, siblings can make ornaments that express personality, and get really creative. It’s a wonderful way to give to each other! We write down names and have each child choose a name, mom, and dad participate too. 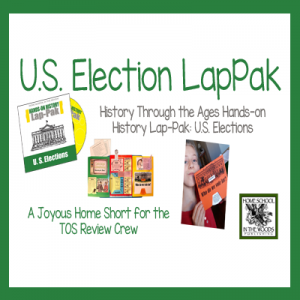 We usually do this on Thanksgiving Day after we eat. Here is a selection of ornaments we’ve made for the tree this year. First, let’s talk about walnuts. You can really get creative with them! But splitting them in half so both halves are usable is a challenge. 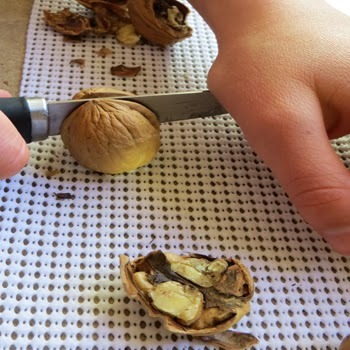 Note: Always check the walnuts for blemishes or cracks before buying – and the cost for about 6 walnuts is less than $1! That will give you 12 halves if you don’t mess up. 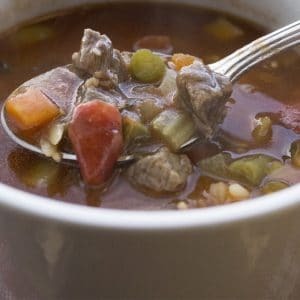 Preheat the oven to 250 degrees and toss the whole walnuts into a pan. 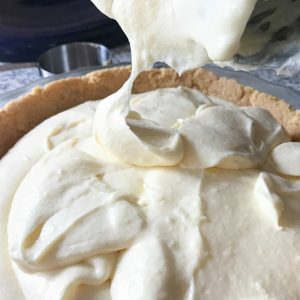 Bake for about 20-25 minutes. 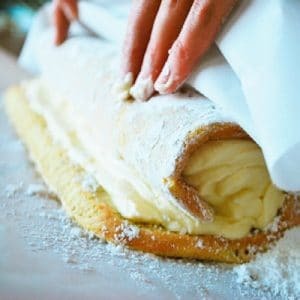 When you can pick one up, take a sharp knife (mom or dad only), and put the knife on the slit and push gently down some. Give the knife a sharp push down, BE CAREFUL! 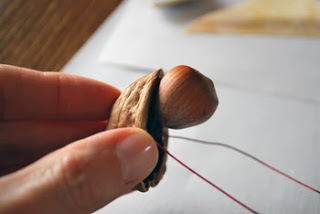 The nut should fall cleanly in two. 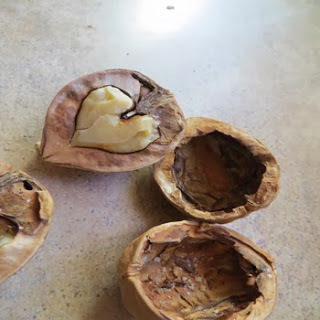 My 15-year-old daughter figured this out after I destroyed several walnuts. Note the rubber, it works to hold the slippery thing in place. 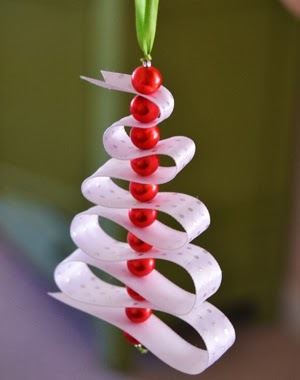 This an easy ornament, the children will love this! 1. Make a tiny face with the marker on the hazelnut. I just did closed eyes and tiny mouth. Glue the head to the pointed side of the nut. Cut a length of wire to hang, and glue each end inside. 2. Pull the cotton ball in half. A whole one was too much. 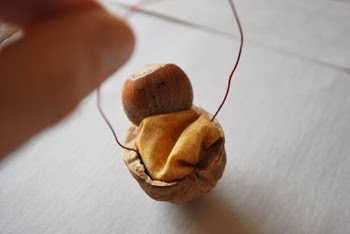 Wrap your cotton ball like a little present, and glue – while hot, tuck inside the nut so it sits nice and cozy. Use a toothpick to ‘adjust it around’. It should fit snug but loosely like a blanket. 3. 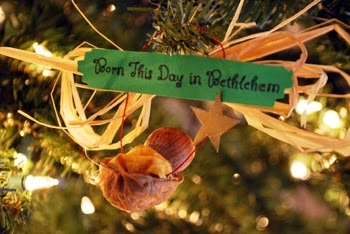 Print out on card stock Born This Day in Bethlehem. I made an image .5″ high and 2″ long and put the text on it. I cut it out and trimmed the edges with decorative scissors. 4. 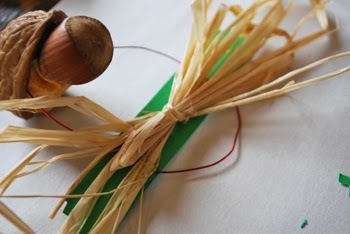 Now, take some raffia and tie it in the middle with another piece, making a sort of bow. You want to sandwich the wire between the sign and the raffia on the back. I just laid the raffia down, ornament with wire on that, put hot glue on, and pressed onto the sign. 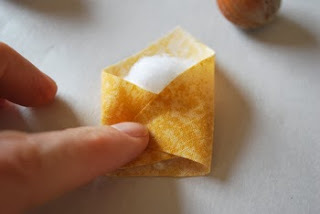 Just do it carefully with minimal glue! You can always add a little more from the back. 4. Cut out a star and paint it gold. I cut part of the star, then stamped it and finished cutting. It was easy. Glue onto the front! All done! Always write the year somewhere on your ornament. I wrote ours on the bottom of the walnut. Bell hangers are expensive! 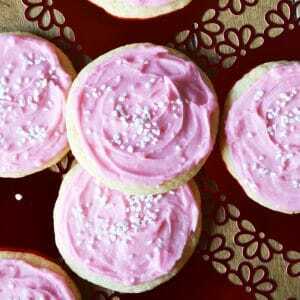 These are easy to make, use a coupon when you buy the bells! 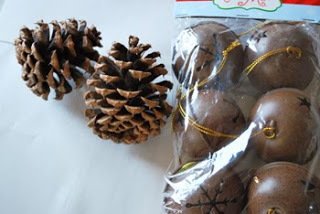 Pinecones – We found our outside, easy in Colorado! You may need to purchase some. 1. 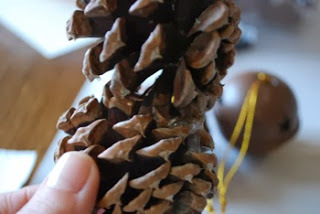 Glue two large pinecones together, one sitting a little higher than the other. 2. 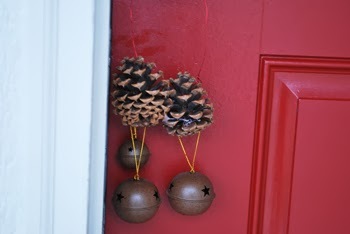 You want to glue the hangers from the bells to the pinecones, staggering the height of each. Hang as many as you want. 3. 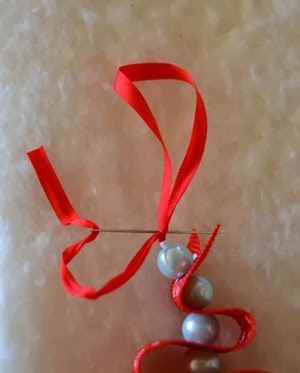 Use the wire from your last project and cut a long length for the hanger. Take one end and wrap around the inside one pinecone, bring back to the wire and twist. Repeat for the other side. How easy is that? You’re done! 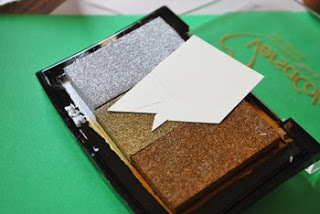 If you make a mess with the glue just wait until it’s dry and pick off. I had an afterthought on this – brush some fake snow on the ends. How pretty! 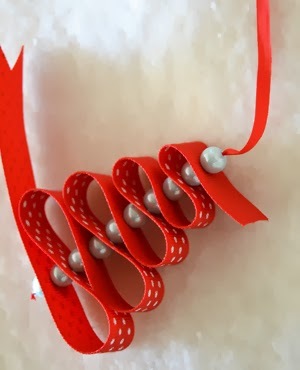 On one side of the 19″ piece of ribbon (the wrong side if the ribbon is not double-sided) Make a single dot in the center of the ribbon 3″ from the end. Make another dot 2 3/4″ away from this dot. Continue, spacing each dot after at these points (specified below), stopping at 1″. 1. 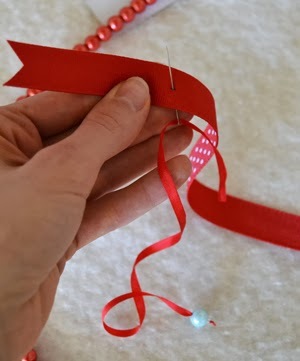 Thread the embroidery needle with the silk ribbon and knot the end with a single tight knot. 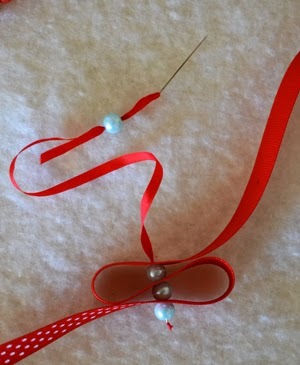 Slide one seed bead over the needle and pull to the end of the ribbon so that sits on the knot. 2. Start with one pearly bead. Slide down to meet the other seed bead. 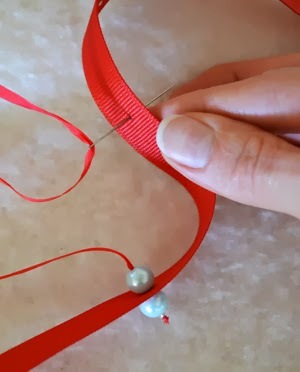 With the wrong side of the ribbon facing you, bring the needle up through the first marked dot, from the right side of the ribbon, pull through. 4. 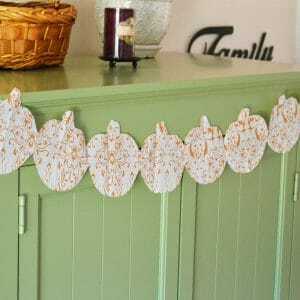 Continue the pattern until you finish with the last dot; top with one last pearly bead and the last seed bead on top of this. 5. 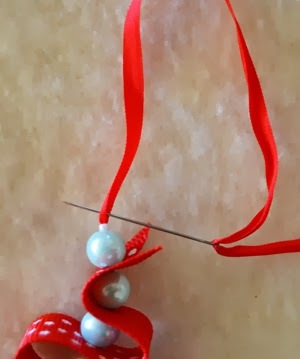 To make the ribbon loop and finish off – run the needle through the ribbon at the top of the bead as shown. Pull through until loop forms, stop when it’s the right size. Run the needle back through from the opposite side; pull through, but stop right before the loop closes, and pass the needle through the loop, then pull until tight and snug. This will complete a knot. Clip the ribbon. 6. 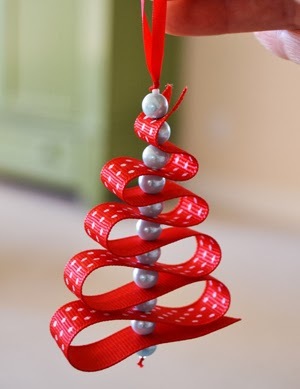 Trim the ribbon on the top and bottom of the tree, and finish off with a triangular cut into the ribbon end. Finished!